The chill in the air, the falling of the leaves, and the wide array of trench coats sported by fellow Manhattanites remind me that fall is here. Yet another reminder of Fall is the color palette of earth tones that comprise Fall handbags – red, green, purple, and of course, brown. My pick this week is the “East West” Front Pocket Bag from Ellen Tracy. I love the rich cognac weathered leather, offset by burnished brass hardware. 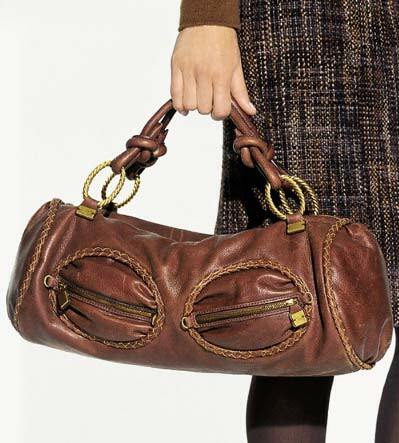 A great new trend in handbags is chunky knotted straps, which add a tough girl vibe to this otherwise feminine bag. An added bonus is the braided trim, piped around the barrel edges, and surrounding the two bulging front pockets. The pockets are both fashionable and functional, giving you extra space to store your stuff without sacrificing style.